Everyone has financial goals that they are saving for. Some people want to retire early. Others want to send their children to private school or save for college tuition. No matter what you are saving for, there will inevitably be challenges that you face. Every time I walk into Wal-Mart, I have to look the other way and walk faster when I’m in the electronic section. DVDs are my downfall. I am always looking for a new movie to watch. I have to constantly remind myself that I am saving for my retirement goals. Have you seen these silly bands? Everyone has them. You can get them in all kind of crazy sizes and shapes. My kids are crazy over them and wear them everywhere. Because they only wear a minimum of twenty at a time, people always comment about them. And, I see more and more adults wearing them. I even have a green dollar sign one that I wear or leave banded around cell phone as a way to remind myself not to spend money on frivolous things. It works too. I constantly see it. I have been a big fan of writing your savings goal directly on the sleeve that comes with most debit cards. You can even buy clear sleeves for your credit cards before. I wanted to save $10,000 for an emergency fund, and I wrote “$10k” directly on the sleeve as a reminder. You can also take a permanent marker and just write the goal or reason not to use the card directly on the face of credit card. This idea came from the Simple Dollar. Take a picture of your family or a picture of an item you are saving for, such as a vacation to Paris, and tape it around your credit card. The best thing to do, of course, is just to cut up your credit cards and get rid of them. But, if you cannot do that, then just make yourself as guilty as possible for using them, and a picture of your goal will work nicely. Every morning I wake up and do the same routine. I brush my teeth, wash my face, and shave before I got to work. I probably spend a good fifteen minutes in front of my bathroom mirror. I also spend fifteen minutes looking at two goals that I have written in the lower right hand corner of my mirror as well. The bathroom mirror is a great place to remind yourself to reinforce good habits or to watch your propensity for bad ones. I look at the mirror every day, and I’m reminded not to hit up McDonald’s for breakfast despite how good their bacon, egg, and cheese bagel is. The bathroom mirror is a great place where you are held captive. Reinforce yourself with good messages to yourself there. Wearing a regular rubber band is kind of like tying a string around your finger. Every time you think about buying something that you know you shouldn’t, snap that rubber band around your wrist. Make it hurt. The negative connotation will help reinforce that you should not be doing that action, and believe it or not, it will help you curb your spending. Not spending money is a hard thing to do. Reminding yourself that you are saving for a goal or a retirement dream that may be decades away is hard. Everyone wants that instant gratification. There are a few tricks that we can do to help ourselves, but you have to be open to new ideas. Wow, I hate silly bands, but that one is awesome, I think I would wear it and proudly get made fun of. Some of the others seem too intrusive (putting a picture on my credit card would make it hard to fit in my walley), and since it should be a pride thing (to save money and make smart financial decisions), I’ll stick to the silly bands and the bathroom mirror action items. I really like these ideas. One or more of them should help anybody who is struggling to stay with their savings goals. – If you want to get rid of your credit card balance, you can wrap your credit card statement around your credit card. It should take you a while to unwrap the card. By the time you are done, the urge to spend will have passed and you are a little closer to paying off the balance. I love all these ideas. 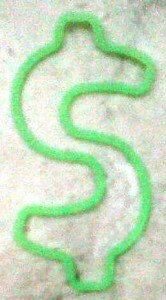 I first heard about silly bands in July when traveling with a co-worker with young kids. She picked up a pack for them and had to tell me what they were. I think I would wear the one with the money symbol!